← Why are we risking Canada’s blood supply – again? Home care in Ontario is in crisis, and everybody knows it. Patients know it. Home care workers know it. The Auditor General knows it. And now, the Government of Ontario knows it. Back in December, Health Minister Eric Hoskins put out a discussion paper on how to fix home care. Patients First, he called it. The trouble with home care, the minister suggested, is the way government has structured it. With that analysis, the solution was obvious: we need to restructure. How? Get rid of the Community Care Access Centres (CCACs) that manage home care now, and move their work into the Local Health Integration Networks, or LHINs. There’s nothing wrong with restructuring, necessarily. No one will miss paying the jumbo salaries of the CEOs of the CCACs. On the other hand, the LHINs were created to download responsibility for health care from government to unelected regional officials. Their main purpose was political: to insulate cabinet ministers from unpopular decisions. So how handing home care to the LHINs will fix it isn’t clear. The truth is, Patients First misses the real trouble with home and community care. The problem is two-fold. First, health care is grossly underfunded. Under-funded hospitals are sending patients home sicker and quicker. When they get there, they can’t get the hours of home care they need because the community system is underfunded, too. Second, private operators are crawling all over home and community care like ants at a picnic. In her September 2015 report, Auditor General Bonnie Lysyk found that only 61 per cent of the funding the CCACs received was going to face-to-face treatment for patients. So what’s happening to the rest of it? The 39 cents per dollar? It goes to private service providers who are in it for the public dollars. Some of those dollars go to managerial salaries; some go to profits. Far too few of them make it down to frontline workers, who continue to struggle with low wages and insecure jobs – despite the fact that they are looking after our loved ones. Thanks to privatization, we have no idea how hundreds of millions of health care dollars are spent. Private companies aren’t known for transparency. On February 3, OPSEU members in the Community Health Care Sector met in Toronto to discuss Eric Hoskins’ discussion paper. They read the paper; they answered his questions. But their full response goes a lot farther than the questions the minister asked. Do we really want high-quality, stable home care that spends public dollars wisely in a transparent manner? If we do, then there are two solutions: fund home care properly; and quit it with the privatization. 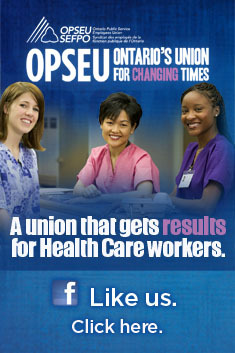 Read OPSEU’s full response to the minister here.